I envy this guy. I’ve envied people who work with their hands for most of my adult life. Carpenters, bakers, bricklayers, machinists, cabinet-makers, glaziers — at the end of their day they have something tangible they can point to and say ‘I did that.’ I baked that cake, I laid the brick for that wall, I laid the foundation for that building, I manufactured the beams that hold that bridge up, I made that table. Most of my professional life I’ve dealt in thoughts and ideas and information. It’s been worthwhile and fulfilling, but at the end of the day, what do I have? Five pages of a manuscript? An interview with a witness? A student who finally grasped a subtle concept? This guy? He’s part of a long tradition of making things out of wood. 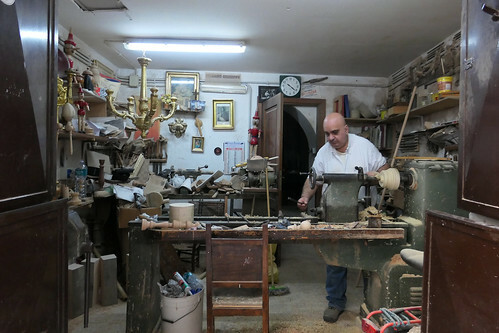 He makes things using his hands and tools that have been used to make things for centuries. Ancient Egyptians were using hand-powered lathes 1300 years before a certain Jewish carpenter made a name for himself in Palestine. This guy has roots and tradition and physical things he can touch at the end of the day. I envy this guy. I wouldn’t want to spend my day doing the work he does, but I envy him.